First off, a report on my weekend eating and exercise. I left immediately after work on Thursday to visit a friend for the weekend. Therefore, I knew I wouldn’t be able to exercise and we had some exciting, yet not so low calorie food plans – including the Cheesecake Factory – doesn’t even belong in the same sentence with “healthy.” Therefore my plan for the week was to maintain my weight, and basically have a maintenance level of calories for the week. 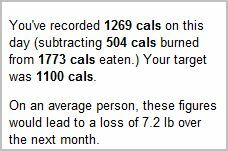 That meant I would have calories deficits during the week and some excess on the week. My plan went pretty well, except for Thursday – for some reason I kinda gave in to Mr. All-or-Nothing and started snacking at work throughout the afternoon, and didn’t make drastic improvements for dinner either – got a huge 360 calorie cookie at Quizno’s. Oops. That wasn’t necessary because it wasn’t planned and I knew I would have a few treats over the weekend. That said, I did well the rest of the weekend with keeping things in check and not eating something just because I was on “maintenance mode” for the week. I had their special Red Velvet Cheesecake at the The Cheesecake Factory. I had been craving it for weeks. MMMMmm! Good! Don’t regret it one little bit. Split lunch size entree with my friend, wisely. Their portions are huge. I’m right back on track in super weight loss mode today, which was the major key to not allowing the extra treats this weekend ruin my weight loss efforts!!! About a year ago, I went on a weekend trip to visit another friend, and I had been so, so well up to that point. That friend loves chocolate almost as much as I do, so the weekend involved a ton of excess calories (none of which I regret) – but where I went wrong is that I let that one weekend derail me for weeks. I didn’t get right back on track on Monday. This time I didn’t make that same mistake. Maybe I am learning something. And my weigh-in results for this week: Down 1.4 pounds!!!! Thrilled considering I just wanted to maintain. Brings overall weight loss for the past three weeks to 6.4 pounds. I’ll take that too! I have a new plan for tackling my snacking problem that I talked about in my last post. I’ll share tomorrow. Also, hope to get caught on blog reading and commenting tomorrow. I hate to see how many unread items are in my Google Reader. Here’s what I’ve been struggling with in my mind lately. Since I started this journey a year and a half ago, I knew I had two major problems that I needed to overcome (among a lot of other things). Diagnosing those problems was not the issue. One of my major obstacles is the “all-or-nothing” mentality that is somehow so deeply ingrained in my thinking. I still have a LOOONG way to go in really overcoming that, however, I can see that I have made some solid progress in the last year and a half. And I plan to make even more progress in the next year. However, my next huge desire to snack all the time, especially on sweets. It’s kinda the opposite of a binging problem, but just a severe and destructive. I want to munch on something small every 15 minutes or so at my worst. All those calories really add up. My whole life that’s what I’ve done. Snack. Snack. Snack. Just a little bite. Just a little taste. Just a little bit! Ah! Before I know it, I’ve eaten the equivalent of two or three pieces of 600 calories per slice cake by just shaving off one little sliverine at a time. Definitely not good. Here’s the thing. I feel like, despite all my efforts, I haven’t really made progress is resolving the true root of the problem. I feel like I’ve just managed to band-aid it at times. And there have been many band-aid efforts. About 4 years ago, I completely fasted for three weeks (water only). Once, I completely gave up chocolate for 8 weeks. I had junk-free January in 2008 where I had absolutely NO sweets -none at all- for the entire month. At some point a little over a year ago, I completely gave up snacking altogether for a couple months. And I really did. But I was having to force myself through it the whole time. I really wanted it to be a lifestyle change and I at least thought I was approaching it with that mindset. And of course I’ve tried the moderation approach countless times. I feel like no matter what mindset and approach I’ve tried, I keep coming back and fighting the exact same battles hundreds of times – sometimes wining, sometimes losing, and sometimes doing more of one than the other. What prompted this is reviewing my posts over the last couple weeks and seeing how many times I wrote something like, “Did really well today except for those snacks.” I mean, really, that should be the title of my blog. So I was considering what to do. Should I try a no snacking no matter what rule and force myself into that for a period of time? Should I give up eating meals so I can just plan a small snack every half hour or so? And then I read a post on Pudget’s blog (Guess What I Did Yesterday) about how she had made a lot of progress with here binge eating struggle. And I’ve been reading her blog since she began it, and when I thought about it, I could really see just from reading her blog posts that she had made true progress. And I want to get that point with my snacking problem – to make some true progress! So my question for all of you is: How do you make true progress (not just temporarily band aiding a problem)? Do you feel that you’ve truly overcome or made progress in any of your eating/weight issues? Any advice? Who needs the gym, when you have two feet of snow!? It’s been a couple days since I updated, so I’ll just have to summarize the weekend. We woke up on Saturday to two feet of snow!! It was unbelievable. Absolutely beautiful. Obviously, we couldn’t go anywhere. 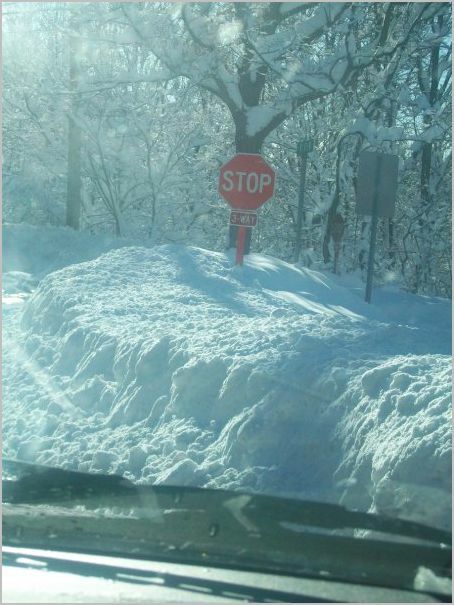 Roads weren’t plowed yet, a state of emergency had been called, and even if we could go anywhere nothing was open (nothing – groceries stores, drugstores, the Y, etc). All this would not have been so bad if only we had power! It went off sometime before 4am, and with such a big snowstorm, we had no idea when it was coming back on. It is really amazing how many things that I take for granted require electricity, including the foods we normally eat. No stove, oven, microwave, and I wanted to open fridge/freezer as little as possible. So all we had to eat were crackers, chips, salsa, candy, marshmallows, and high-calorie homemade sourdough bread. After eating a really early dinner on Friday, I woke up very hungry Saturday morning. Unfortunately I took this situation as license to eat basically whatever I wanted. That’s the not so good part. However, I did want to get some exercise, so I dug out one of cars – took a good 45 minutes of shoveling, worked lots of muscles, and burned some calories! Luckily our power was restored in the early afternoon! This week’s weigh-in: -0.0, stayed exactly the same. Funny, worked out exactly as I thought it would. Unfortunately this week doesn’t look to be a stellar week calorie deficit wise. Leaving Thursday night to stay with a friend, so I won’t be able to work out Thurs, Fri, or Sat plus the food probably won’t be as healthy as if I were eating at home. However, I’m going to continue to do the best I can this week. I really would like just a slight lose, and then I can really pick up my intensity next week. Which brings me to today. I did a killer bootcamp class at the Y. Once again, I made a fool of myself and couldn’t keep up, but I did burn some calories. And I’m liking trying all these new classes. I’m also getting a bit of weight-training which I never did on my own. I burned about 500 calories in 56 minutes. Most of the workout was cardio drills (Jump rope, jogging, sprinting, suicide drills, etc) followed by leg/arm combo moves with weights and a few stationary arm exercises. The last 10 minutes were ab work, and although my abs got a killer workout, ab work doesn’t really burn many calories. The heart rate is really low. Plus, with so much weight to lose, I won’t even be able to see muscle definition until I lose another 70-90 pounds. I tell you, sometimes I think I must be crazy. First off, I was super tired today and had a rather boring day at work sitting at my desk staring at the same stuff on the computer screen all day. Never a good mix. Always ends poorly. So by 9 am I had eaten my breakfast and both little things of pudding I had brought for the day. Went out to lunch with some friends and was very good at Chick-fil-A by ordering a Grilled chicken salad – 300 calories! Good decision. The tiredness really started to set in during the afternoon and time was just dragging on by. It felt like 4pm would never arrive. So I grab some money and start to head for the vending machine. Well, I absolutely hate anyone actually seeing me go to the vending machine – especially if I’m getting something particularly unhealthy like a candy bar. It’s like I’m revealing my bad habits to whoever sees me. As if they otherwise would have thought that I got fat by eating celery and lettuce instead of chocolate and chips. Really – who am I kidding!? But I still have this enormous fear of a coworker seeing me. It’s like I feel like I’m doing something illegal. Anyway, when I started to head to the vending machine there was a big group congregated outside and they stood there talking for like 30 minutes! Finally, they left and I went to the vending machine. I did not want to eat a bagillion calories so I wisely selected a pack of chewing gum. The entire pack (6 pieces, but really 12 b/c I break them in half) was gone within about 30 minutes. I chewed one piece right after the other in my frantic effort to stave away the munchies. When I was still madly craving chocolate and about to fall asleep at my desk, I though of an excuse to get up and walk somewhere about every five minutes. After a half hour of that, I still couldn’t take it – “needed” chocolate – went back to the vending machine for a 220 calorie Kit-Kat bar. Ate it. It didn’t really wake me up and it didn’t make the afternoon go by much faster. When I really need a little nap, that’s what I really need – not little walks or food. But I really can’t nap at work. Something tells me they wouldn’t like that. And, would you believe this? It took every fiber in my being to avoid going back to that stupid machine for another candy bar! But I didn’t. Next time maybe I’ll try super glue on the chair. Oh, and the little tiny cookies I have hear at home called my name a few times today – I forgot to put them in the husband’s car yetserday. Not good. However, I ate fewer than I would have if I hadn’t been really trying. It was that walk in the door, go straight to the kitchen thing. I did get in a 55 minute, 500 calorie elliptical workout. That was good, but I feel like I need to workout harder. I just feel so much better when I work out to the point of feeling like I’m gonna die (exaggeration of course) for some reason. My heart rate got up to about 175, but often if I jog or do other types of workouts, it’ll get up to around 200 – that’s when I feel like I’ve really worked! You are currently browsing the archives for the Daily Report category.